Bravecto 112.5mg Spot-On Solution for Toy Dogs is indicated for the treatment of tick and flea infestations in dogs weighing between 2kg and 4.5kg. Bravecto Spot-On Solution is a systemic insecticide and acaricide that provides immediate and persistent flea and tick killing activity for up to 12 weeks. Each 0.4ml pipette contains 112.5mg Fluralaner. 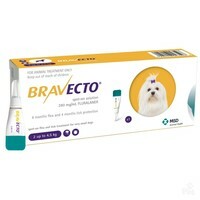 Bravecto Spot-On can be used as part of a treatment strategy for the control of flea allergy dermatitis (FAD).